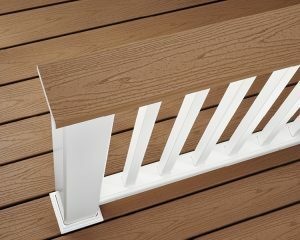 Do you have a composite deck but don’t know how to properly take care of it? Because composite decks are made from wood byproducts (i.e. wood chips, sawdust) and plastics, they require less maintenance work than other wood decks. These type of decks come in a variety of styles, colors, and grains to choose from. Taking care of your composite deck isn’t a hard process at all. The first thing you should do is to grab a broom and dustpan and begin sweeping your deck. Sweeping frequently will help keep your deck clean. As you’re sweeping, make sure to sweep all of the debris off of your low maintenance deck. Pick up any leaves or sticks that might be stuck within the cracks of your deck board. Composite decking material cannot be sanded nor refinished so if you see any stains on the deck, be sure to address them quickly so that they can be removed. Next, scrub your deck with soap and hot water or composite deck cleaner. Use a deck brush while scrubbing the surface of your composite deck. The deck brush that you use should have soft bristles to make your deck even smoother. Finally, rinse off your low maintenance deck using the water hose. Make sure all of the soap’s residue is removed. If your composite deck has any marks on it, use nail polish remover, rubbing it in a circular motion, on a wet cotton ball to get it off. Once finished, allow your deck to dry. Miles Bradley Building and Remodeling, INC specializes in building composite decks. If you’re interested or have any questions, contact us at any one of our locations. Thoroughly clean your deck. Before doing anything else to prep your deck or patio for the winter, cleaning the entire deck is a must. Using a formulated deck cleaner, wash away dirt, dust, mold, or mildew from corner to corner. Smooth your decks finish. Walk around your deck and search for cracked or chipped areas of your decks finish. You will want to fix these problems as they will worsen and possible damage your wood come spring. Depending on the type of finish you have on your deck will determine the proper products for removing areas of finish that need to be restored. Restore your decks finish. After you have removed unwanted finish from your deck, you will want to restore it before winter comes. If you leave them unfinished deterioration of the decks wood will occur, causing the need for wood replacement. Seal your deck. Using a water repellant wood sealer, cover your entire deck. The water repellant will prevent sitting water from damaging the wood. Moisture spikes during the winter, as snow and ice tend to sit on decks. Not sealing your deck can cause wood to crack or warp from moisture. Following the above steps can significantly save you from costly repairs. If your deck is already in need of replacement contact Miles Bradley Building and Remodeling in Michigan or Chicago, IL today, and ask about our low maintenance decks, eliminating the need for winter preparation!